South Korean President Moon Jae-in said Monday he's ready for a fourth summit with North Korean leader Kim Jong Un to help salvage faltering nuclear negotiations between the North and the United States. Moon spent the past year making aggressive efforts to stabilize South Korea's hard-won detente with North Korea and improve bilateral relations. He also lobbied hard to set up the first summit between Kim and Trump last June, when they agreed to a vague statement about a nuclear-free Korean Peninsula without describing how and when it would occur. 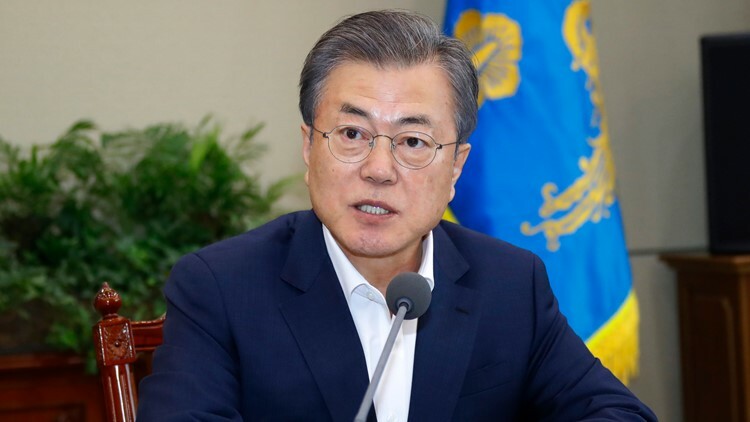 Moon has said it is Seoul's "outmost priority" to prevent nuclear negotiations between the U.S. and North Korea from derailing, and there is speculation he will soon announce a plan to send a special envoy to Pyongyang, North Korea's capital, in an effort to rescue the talks. North Korea in recent weeks has been registering displeasure with Seoul, withdrawing its entire staff from a front-line liaison office with South Korea before sending some of them back, and refusing to show up for a previously planned joint search for war remains at the two countries' border. In a speech delivered to North Korea's rubber-stamp parliament last Friday, Kim said he is open to a third summit with Trump but set an end-of-year deadline for Washington to offer mutually acceptable terms for an agreement.